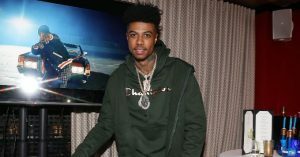 Quickly rising California rapper Blueface was arrested for gun possession in Los Angeles this past weekend. After a night of jail, he eventually made bail at $35,000. Gossip site TMZ recently released video of the arrest. IIn the video we see Blueface being escorted away with handcuffs on. LAPD claims they were called to the scene in downtown L.A. spot because Blue and his crew were wearing a lot of jewelry in an area where robberies are known to take place. They allegedly showed up for fear that the rapper and his entourage would be easy targets for robbers. As police pulled up to the scene, all of the young men threw away their guns and quickly tried to flee the scene. Soon after, they were captured by police. Check out the video of Blueface’s arrest below.